Our sincere aympathy to you Cheryl & Dennns and family. Your Mom always had a smile on her face. Our thoughts and prayers are with you at this time. God bless. My condolences to Annie’s family. 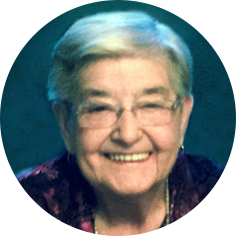 I knew her as a neighbour and through the church – she was a wonderful lady! Our deepest sympathy to the whole Ludwar family. Your Mom Anne will be missed by many ,May all the happy memories help ease the pain you are all going through. Please know we are thinking of every one of Anne’s family. She was such a pleasant lady. We know how much she will be missed. We are currently away and are sorry to miss the mass tomorrow. Our condolences to the Ludwig family. Thoughts and prayers are with you Randy and Brenda. My thoughts and prayers are with the extended Ludwar Family. Annie always had a bright smile for everyone. She was a kind and gentle soul. Extending our sincerest sympathy to the Ludwar families.